CHAUVET DJ has announced the release of two LED fixtures that are joining the Intimidator family of powerful moving heads and scanners: The Intimidator Spot LED 250 and Intimidator Spot LED 350. 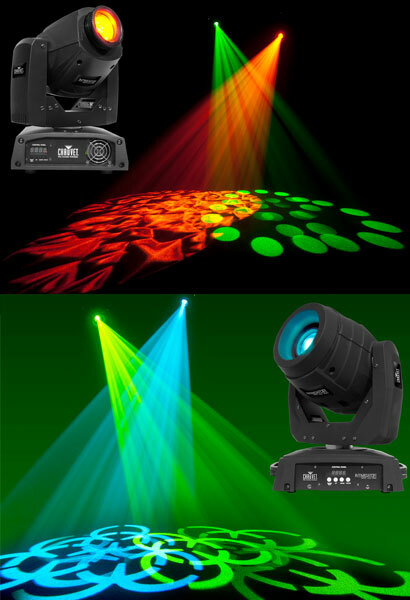 Both fixtures are ideal for enhancing mobile rigs and adding alluring effects to club installations. Eight colours and seven gobos (on separate wheels) produce an array of effects, while a three-facet prism multiplies the beam covering a larger area. An easy-access gobo door is provided for quick gobo changes without opening the fixture, which means that it is easy to install custom gobos. Selectable pan-and-tilt ranges give users exacting control over the beam’s position, while an electronic dimmer allows for smooth LED fading. Built-in automated programs generate a synchronized show in master/slave mode, or the fixtures can be integrated into a custom light show via their DMX mode, using either eight or thirteen DMX control channels. DMX programming time can be minimised thanks to the useful ‘move-in black’ feature as well as a collection of built-in effect macros. The Intimidator Spot LED 250 is a bright fixture powered by a 45-watt white LED. It weighs a mere 5.7kg and is 236 x 205 x 287mm in size. The Intimidator Spot LED 350 is powered by an incredibly bright 75-watt white LED, and features motorised focus for crisp gobo projection and manual zoom for long-throw applications. This compact unit weighs 10.3kgs and measures 268 x 340 x 392mm.